Milk alternatives differ in nutritional value. Read the labels to make sure you're getting a product that is low in sugar and fat, and high in protein and calcium. Soy, nut, and grain milks are available. But are they right for you? Low-fat milk is a great source of calcium, protein, and other essential nutrients, and it tastes great on a breakfast cereal. But not everyone wants to drink cow's milk, and some people have trouble digesting a natural sugar in milk called lactose. "People complain that it causes gastrointestinal distress. They may be lactose-intolerant, or just lactose-sensitive," says Linda Antinoro, a registered dietitian with Harvard-affiliated Brigham and Women's Hospital. "Milk doesn't settle well with them, so they're looking for alternatives that don't cause diarrhea or bloating or gas." The good news is that there are milk alternatives. Some are better for you than others, however, and you'll need to pay attention to their ingredient lists. Remember, too, that you should avoid milks with added sweeteners, such as most chocolate- or vanilla-flavored milk alternatives. Consider the following options to keep milk in your diet. "Most people who want an alternative try this first," says Antinoro. Lactose-free milk has an enzyme added to it (lactase) that helps break down lactose into more easily digested sugars. You'll still need to buy low-fat lactose-free milk. Full-fat milk, with or without lactose, is rich in saturated fats, which increase LDL or "bad" cholesterol. One caveat: if you're allergic to milk, lactose-free milk may not be an option for you. Soy milk is the fluid strained from a mixture of ground soybeans and water. Its nutritional content is similar to dairy milk, including moderate amounts of fat that make it comparable to 1% cow's milk. It's also high in protein like real milk, with about 8 grams in one cup of soy milk. But soy also contains oligosaccharides, another type of sugar that some people have trouble digesting. Soy also is a weak estrogen. Since estrogen is linked to hormonally sensitive cancers, some women wonder if they can drink soy milk. "The verdict is still out on that, but it may be prudent for high-risk women to limit soy milk to one serving per day and consult with their doctors," says Antinoro. 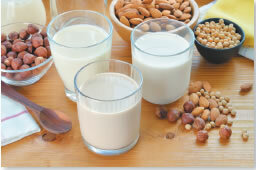 Nut milks—the fluids from a mixture of water and ground almonds, walnuts, or hazelnuts—are free of lactose, soy, and even gluten (a protein some people have trouble digesting). They are low in calories and fat, and the types of fat they do contain are unsaturated, which are good for you. For example, one cup of almond milk has 2.5 grams of unsaturated fat. But nut milks are very low in calcium and protein, so you'll have to look for fortified versions. "But even then a cup of almond milk might only have 5 grams of protein compared to 8 grams in soy or cow's milk," says Antinoro. Most nut milks also contain carrageenan, a seaweed extract that's used as a thickening agent. "Carrageenan is FDA-approved, but there is a suggestion that it can aggravate intestinal problems, so you may want to avoid this if it upsets your stomach," says Antinoro. Grain and seed milks—the fluids from a mixture of water and ground rice, oats, quinoa, or hemp—are about twice as high in carbohydrates and sugar than other milk alternatives. For example, one cup of rice milk contains 23 grams of carbohydrates and 10 grams of sugar, as opposed to 9 grams of carbohydrates and 6 grams of sugar in one cup of soy milk. Too many carbs and sugars can spike your blood sugar, which over time can lead to damaging inflammation. Grain and seed milks are also very low in protein and calcium, so you must look for fortified versions of them. Is it okay to be fat if you're fit?